Left: Rouse's department store on the east side of Main Street between University Avenue (8th Street) and 9th Street in 1928, after the building was renovated to a Mission Revival style by G. Stanley Wilson. Right: Gaylor Rouse was President when Tom Hays was tried for embezzling and breaking the Orange Grower's Bank, located in this building at the northeast corner of University Avenue (8th Street) and Main Street. 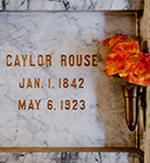 Gaylor Rouse was business leader in the city of Riverside. He began in upstate New York where he acquired a retail store and honed his business acumen. His first wife, Frances Larned, mother of son, Charles Gaylor Rouse, died in 1876. 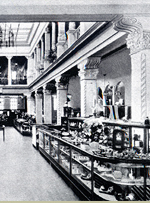 In California, Rouse owned stores in Antioch and Santa Barbara. While in Antioch, he met and married Rhoda Jessup who had two children, Raynor and Ivy Jessup. By 1889, he was in Riverside and owned G. Rouse Company Dry Goods and Shoes. Rouse took over a store once founded by John T. Jarvis on the opposite side of the Main Street from where Rouse’s signature store was located. The Rouses Inc. store prospered for decades at 3850 Main Street. Only July 3, 1891, Rouse became a director of the brand new Orange Growers Bank, capitalized with $250,000 and with M. J. Daniels as president and Frank Miller among the stockholders. One of the first acts of the new directors was to name Tom Hays as Cashier for the bank. Rouse was a significant part of the business and financial climate of Riverside during the late 1890s thru the early 1900’s. He was a member, with Tom Hays, of the Rubidoux Club. Members played cards and billiards, talked business, and read the latest magazines. In 1892, as a director, Hays saw the club move to new quarters in the new Rubidoux Building at the southeast corner of Main and Mission Inn Avenue. Bank president M.J. Daniels, Frank Miller, and Rouse were also directors along with many of Riverside’s leading businessmen. In 1902, Rouse participated in the formation of Frank Miller’s Glenwood Hotel Company, purchasing five shares in support of Miller’s effort to capitalize the expansion of what would become the Mission Inn. In November 1903, due to Tom Hays energetic campaign work, bank president M. J. Daniels was elected to congress. Rouse began to serve as interim bank president. But almost immediately, Tom Hays brought shame on the bank and Gaylor Rouse’s role as interim president became increasingly important. Despite his resignation, Tom Hays continued to occupy his position of privilege in Riverside’s civic life, presiding over Elk’s Club events and celebrating the arrival of the railroad with a champagne party. But the railroad scandal was only the beginning. On March 21st, after presiding at a lodge meeting, Hays went into hiding. News had leaked that there was a large amount of money missing from the Orange Growers Bank and a run on the bank forced it to close at noon. Sheriff Coburn had a warrant for Hays arrest. On March 22nd, the bank was forced to close following a run on the bank caused by Tom’s embezzling. For three days Hays hid amid rife speculation about his whereabouts. The amount of the embezzlement was reported by the Los Angeles Times at $100,000. Many people were affected by Hays actions, most particularly the bank’s directors including Rouse and stockholders, including Miller, who were required under laws at the time to make good on what turned out to be a $94,000 loss. In January, Rouse became bank president. On March 30th, in Judge Joseph Noyes court, Tom pleaded not guilty. His lawyers were Frank Densmore, Eric Gill, and Miguel Estudillo. The Orange Growers Bank was a national bank, and as a result the federal grand jury in Los Angeles took testimony. On May 6th, Hays again appeared in Noyes courtroom where, state charges dismissed by Noyes, Hays was handed over to be arraigned in the U.S. District Court in Los Angeles. There Tom’s luck changed and he was released on $30,000 bail. He would not face trial until April 1905. At the trial in Los Angeles, Rouse testified that Hays had failed to keep any bank minutes from March 28, 1902 through July 1903, as required of a national bank by federal law. He added that the bank’s Minutes Book was missing. Tom’s brilliant defense attorney accused the bank directors who were responsible for the missing minutes and suggested they were persecuting Hays to hide their own guilt. The trial showed that the directors were not paying attention and that Hays was virtually completely in charge of the bank, manipulating the day’s totals to take several thousand dollars at a time. Other bank employees who testified as to the details of the embezzling had their testimony disallowed as a result of sharing information with each other. In the end, the dispassionate but factual arguments of the prosecution failed to move the jury and they voted 9 to 3 for acquittal. Eventually Hays was tried and convicted on a fraud charge for his railroad dealings and the last of his Riverside property was used to pay a portion of the judgment in June 1906. 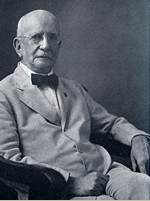 Hays died of heart problems on January 12, 1907. Rouse’s son, Charles Gaylor Rouse was Vice President of Rouse’s, Inc. for many years. In 1927, the store was expanded and remodeled featuring Hispanic Revival Movement designs of G. Stanley Wilson, noted Riverside architect. Gaylor Rouse’s stepchildren were also officers of the Company. Ownership and management changes eventually led to the closure in 1964 of one of downtown Riverside’s best department stores.